The mainstream U.S. press explains the overwhelming Crimean vote to leave Ukraine as vote-rigging or coercion, but the reality is that “European aspirations” are not so attractive to people aware of the painful life for many in the EU’s “periphery,” from Spain to Greece. As the West tries to lure crisis-stricken Ukraine into the European Union’s fold, a major selling point is the promise of a brighter economic future. But the reality for many Europeans – especially in countries pummeled the hardest by the Great Recession – isn’t all that appealing, even as some EU bureaucrats are touting a recovery. It’s true that raw numbers show that the recession appears to have bottomed out, even in some of those hard-hit nations on Europe’s “periphery,” from Ireland in the west through Portugal, Spain and Italy in the south to Greece in the east. For instance, Spain’s economy contracted 1.2 percent in 2013, but most of that was in the first half of the year, and the EU projects 1 percent growth for Spain in 2014 and 1.7 percent in 2015. Plus, for the first time in years, Spain had positive net job creation in February. But that will translate into little relief for the nearly 27 percent of Spain’s population which is unemployed, or for the nearly 1.5 million who fell into extreme poverty during the crisis, according to a bellwether report in Spain. During the crisis — to meet EU “austerity” demands — pensions were frozen, the welfare state was slashed, and taxes ate away purchasing power. There’s little hope, too, for the millions more who lost their middle-class status. At the street level, the “recovery” is nowhere to be seen, at least not for nine of every ten Spaniards who say this tepid economic growth has not trickled down to them. Almost three-quarters of Spaniards expect that conditions will remain the same or get worse in 2015, according to several recent polls. When you walk around Spanish cities, what you see is a very noticeable increase in visible poverty, including people who until recently might have been considered middle class. You see middle-aged men in suits begging in the streets or waiting in charity lines. You see evicted families seeking refuge, immigrants on the move, and I’ll-work-for-food offers online. Thus, while the Spanish government and the EU can tout the signs of a recovery, a sense of hopelessness still hovers over the many unemployed and real panic grips even people with jobs because they fear what may lie ahead. One reason for the discrepancy between improving economic numbers and most people’s perceptions of their own situations is the spread of income inequality during the crisis. The wealthy few experienced significant improvements – thus bumping up the GDP numbers – while most everyone else either barely held steady or declined, sometimes sharply. During the crisis, salaries rose for the biggest earners, but decreased 16 percent for the bottom brackets, according to official statistics. All that has left Spain with the EU’s second worst wealth distribution, according to the Gini coefficient, the most widely accepted barometer in the field. In Spain’s political world, the two conflicting narratives – one buoyant and one depressing – coexist with most of officialdom pushing the positive, but other political leaders noting the negative or what they would call the reality. Most agree that Spain did what it was ordered to do by the EU – and what it was given little choice to do by financial markets. As a result, Spain’s fragile economic recovery has drawn support from the European Central Bank, and investor appetite for investing in Spain and other countries on Europe’s “periphery” has improved as broader European risk perceptions have subsided. Many Spaniards agree that some painful reforms were unavoidable because the economic model that had generated a boom in the previous two decades was artificial, much as it was in many other parts of the Western world. Cheap credit fueled rising home prices and a construction-driven economy, but the underlying economic pillars were weak. A false sense of prosperity continued only as long as the bubble kept expanding. Millions of Spaniards enjoyed the good times, with wasteful spending on extravagant public projects, a swelling civil servant population and an inflated real-estate market. Blue-collar workers bought homes, cars and vacation spots on cheap credit. Consumers spent and spent. People lived beyond their means as the cash kept flowing and the economy expanded. When the bubble burst – amid the Wall Street crash of 2008 – the illusion of prosperity disappeared quickly. Money and credit evaporated, but costs didn’t. Debt levels starting rising, along with defaults. The EU’s central bankers responded with harsh demands for austerity to bring public spending in line with the reduced capacity of these suddenly shrunken economies, especially in the “periphery” nations, such as Ireland, Spain, Portugal, Italy and Greece. Spending was cut drastically and millions were thrown out of work. Spain’s record high public deficit, which in essence shut out Spain from credit markets, has gradually shrunk and now stands at 7.2 percent of the gross domestic product, but that’s still more than twice the 3 percent ceiling mandated by the EU. Meanwhile, the total public debt as measured against the reduced GDP has soared to 100 percent, a record. According to projections, the deficit will continue decreasing in coming years, but not as fast as the EU is demanding and the EU has warned Spain not to scale back on austerity because its raw numbers remain in the red zone, even if things are improving. Beyond austerity, Spain needs to cheapen its economy to make it more competitive, but devaluing its currency by printing more money, as most countries have done, including the U.S. and Japan, is not an option because Spain uses the euro which is controlled by the EU’s central bank. Economists agreed that the only option left – to both spur private investment and access cheap credit – was to force an internal devaluation, which translated into lowering labor costs by allowing companies to dismiss more workers and cut salaries of those who remained. Thus, labor statistics show average wages falling – hitting lower earners especially hard – and Spaniards working more, as expressed through increased labor hours. For 2014, the trend is expected to continue since this internal devaluation process is not complete. With the worst part of the economic crisis now presumed to be over – not just in Spain but more broadly in Europe – the debate is now focused on how to distribute the benefits of the recovery so the growth can be more sustainable. Along those lines, the Spanish government has promised tax cuts and other measures that it claims will ease austerity and create jobs. But the EU is keeping Spain on a tight leash, meaning that there may not be much relief for most Spaniards. Much will depend on the resilience of larger European economies. 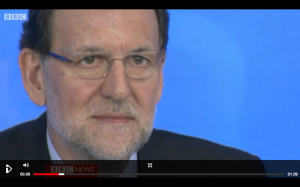 Politically, Prime Minister Rajoy’s government has until 2015 before it faces regional and national elections. How painful the austerity still is could determine whether Rajoy and his party will gain another term. But Spain’s unemployment rate is simply too high and the economic growth too slow to expect things to bounce back to where they were any time soon. In fact, they won’t. The most likely future for the average Spaniard, like other Europeans in the hardest-hit economies, is a painful and difficult one. If Ukraine does decide to move toward integrating into the EU’s economy, Ukrainians, too, can expect a painful adjustment.